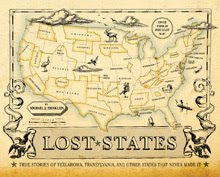 Lost States: Criminal Corner - Another spot for the perfect crime? 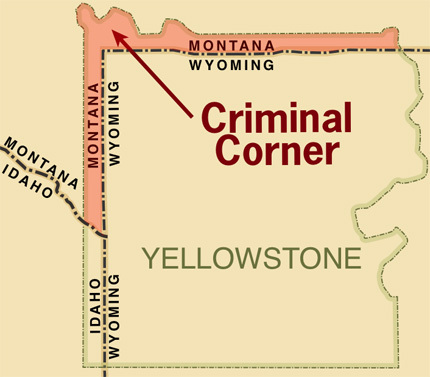 Criminal Corner - Another spot for the perfect crime? Yesterday we laid out the case made by legal scholar Brian Kalt that major crimes committed in the Idaho portion of Yellowstone National Park can not be prosecuted because of a legal loophole. Reader DanV wisely wondered why the same situation wouldn't also apply to the Montana portion of the park. It does, sort of. Remember, the reason criminals would go free in Loophole Land is because a jury could not be formed from residents of the required location (the Idaho portion of the park) because no one lives there. But the Montana portion of the park does have residents... about 40 of them. That said, a sharp lawyer could argue that 40 people isn't enough of a pool from which to draw a jury, but a judge could reasonably disagree. But if your heart is set on committing the perfect crime in Montana's "Criminal Corner" you do have one other option—get your buddies to do the same thing. While 40 residents might be enough for one jury, it wouldn't be enough for 3 or 4 simultaneous trials. So if you and your friends commit multiple crimes... and draw straws... only the loser would likely face a trial. That's because—by the time the 3rd or 4th trial could be scheduled—too much time would have passed for the "speedy" trial required by law. But again, don't try this at home. Crime is bad. Prof. Kalt agrees... he just wants the loophole closed.